GBT's first production ever about a plump teenager, Tracy Turnblad, who teaches 1962 Baltimore a thing or two about integration after landing a spot on a local TV dance show. "I've never been a producer before, so I don't know exactly what one is supposed to do. For this show it meant a lot of being persistent, and learning from my mistakes; sometimes it felt like I was dragging a whole cast and crew through my own semester-long learning experience. 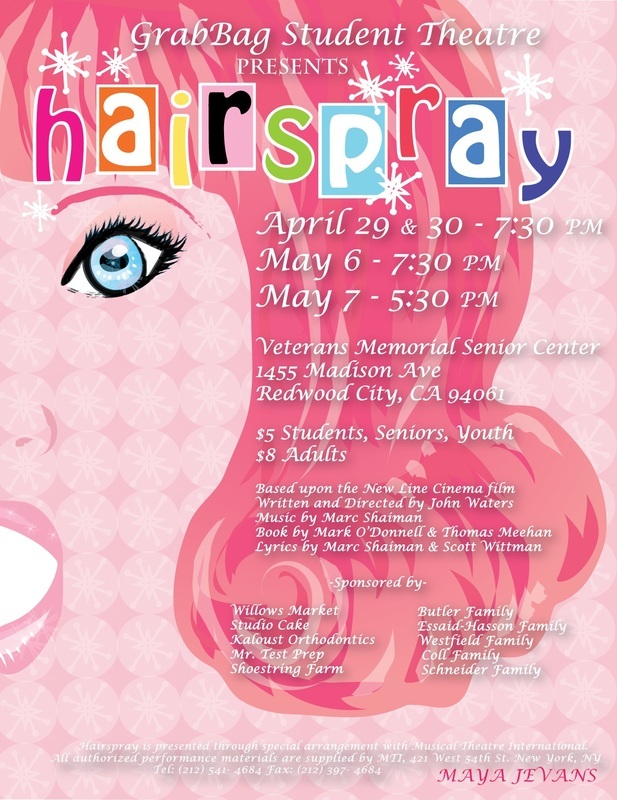 "At the beginning of Hairspray, all we knew was what a good show looked like, but now - and I hope you'll agree - we have a pretty good idea of how to put one on. "There were a lot of stressful periods throughout this show, when we just weren't sure what our next move should be. Early on, Dana, Rasa, Isiah, Nina and I would meet on Sunday mornings, and in half an hour, come up with a page-long list of things that we needed to do just for the week. It looked like an impossible task, but three things saved The Grab Bag Theater Company from collapsing before it had a chance to take the stage. "First and foremost was our stage manager, Nina Lozinski. She is, without a doubt, the best thing that happened to this show. She has dedicated more of her time to this project than anyone, even though she originally only signed on to take blocking notes and manage attendance. Just before Hairspray opened, school went on spring break and I was out of town for more than a week. Not a day went by that Nina didn't call me to check in about the work she was doing while everyone else was on vacation. Her title should be something more like Stage Manager/Set Designer/Assistant Director/Tech Director/Co-Producer. Her dedication to this show, and her sense of responsibility are remarkable, and I can't thank her enough for having stuck with me through all of our ups and downs. "Another saving grace was the community support that sprung up around The Grab Bag. Despite the tough financial times, we had many family and business sponsors and donors, and we couldn't have put it on without the parents in the cast who volunteered their time to build sets, bring us food, and helped us find the spaces we needed to perform and rehearse in. This show worked because everyone around us believed it would work. Everyone bought into the absurd idea that a bunch of kids could put on a show as big as Hairspray, and their belief in us made it happen. "I'll leave you with this, in the hopes that it will get you excited for the curtain to open. I love Hairspray. On those long Sunday mornings, things could look so bleak and overwhelming, and I asked myself more than once why I had gotten into this. Then we would put on the CD to work out the blocking on a scene or two, and we just couldn't turn it off. It's those hours - the ones wasted dancing and laughing around Dana's dining room table - that I try to remember. "They reminded us that this isn't about what happens behind the scenes, but what happens on stage. We are theater people, it's our art, and what made the phone calls and emails, the organizing and the planning, the time and the stress worth it is simply that I get to sit in the audience for four nights and watch art come together on stage. And I get to know that I helped make it happen."